Apple's Chinese sales fell 14% during the company's fiscal third-quarter. 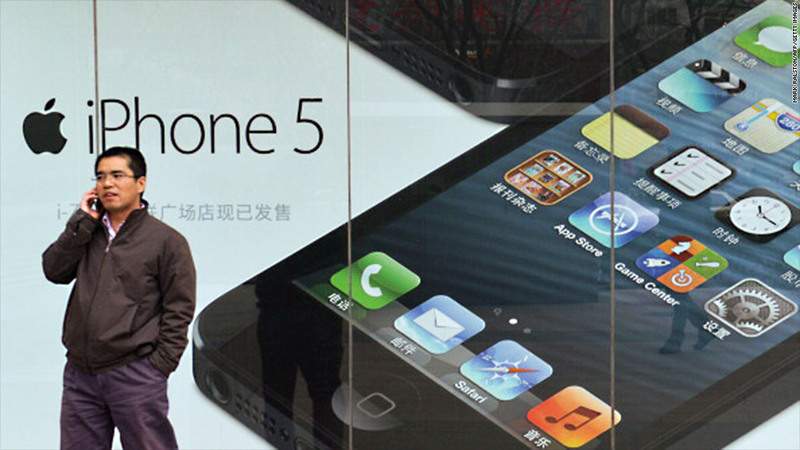 Apple has long viewed China as its biggest growth opportunity. But it reported Tuesday that its sales in China are sliding. Apple's sales in China, Hong Kong and Taiwan fell by 14% in the company's third quarter. That's a sharp reversal from 8% growth in the prior quarter, and a gain of 67% before that. On a conference call with investors, CEO Tim Cook had answers for most -- but not all -- of the recent China problems. Cook chalked up most of the decline to bad timing. The iPhone 4S started selling in late March 2012, which led to a big boost in iPhone sales in last year's third quarter. iPhone sales this time around would of course be down from that. The iPhone 5 was released in December 2012, so its boost came earlier this year. Cook also said that Apple's sales looked worse than they actually were because the company better managed its Chinese inventory. The company sold fewer iPads and iPhones to retailers than it did a year earlier, which dragged down revenue considerably. But the sales those retailers made to Chinese consumers declined only 4%. Cook said that "sell-through" rate was even less troubling if you exclude Hong Kong, which had a big 20% drop. The sell-through rate was actually up 5% in mainland China. So what happened in Hong Kong? Cook didn't have an answer. "It's not totally clear," said Cook. Whether this was some one-time weirdness or a trend, what's clear is that Apple needs to improve its iPhone sales in China. Its share of the Chinese smartphone market remains less than 10%, and the iPhone ranks behind Samsung, Nokia (NOK) and a host of local brands, including Lenovo, Coolpad, Huawei and ZTE. Cook said the iPhone is growing in importance to China, noting that the company pays half a million app developers in the region -- by far the most of any country including the United States. But he conceded that iPhone and iPad sales "are currently lower than where we would like them or need them today." Though he didn't acknowledge rumors that Apple is working on a low-cost iPhone to attract users in growth markets like China, Cook hinted at it when he said that Apple is working "very cautiously with what we want to do with great quality." Cook maintained his optimism about Apple's business in the region. "I continue to believe that in the arc of time here, China is a huge opportunity for Apple," Cook said. "I don't get discouraged over a 90-day cycle that can have economic factors and other things in it."